Australian Draught Horses was developed from the crossbreeding of four recognized pure draught horse breeds which were in Australia since the colonial days: Clydesdale, Percheron, Shire, Suffolk Punch. The result is a hardy, strong draught horse with a good temperament. The roots of the Australian Draught Horse date back to the c.1854 importation of stallions and mares of various English and Flemish cart breeds to Australia. 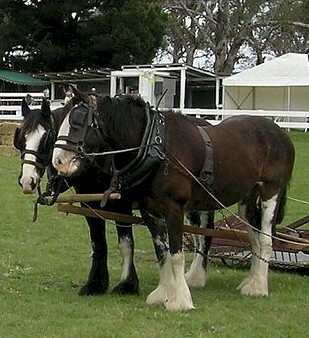 Van Diemen's Land (now Tasmania) was at the forefront of breeding cart and farm horses with the part played by the Van Diemen’s Land Company. This company also imported Shire Horses which were later imported to Western Australia and South Australia in the late 1830s. Bullocks did most of the heavy draught work until the 1850s. The development of the agricultural industry after the gold rushes required a ready of draught horses to provide faster load movements. Scottish settlers did much to promote the use of the Clydesdale horses owing to their familiarity with them. Weinholt Brothers formed a notable draught horse stud at Maryvale, Queensland in 1885. Most states preferred Shire horses, but in Victoria the Clydesdale was more popular. Suffolk Punch horses were favoured in northern NSW and on the black soil country. The Clydesdale Stud Book was established in Australia in 1915, prior to which breeding was somewhat haphazard. After 1918 tractors were rapidly replacing draught horses until the 1930s depression when there was renewed interest in them. By 1950 tractors had virtually replaced the draught horse on rural properties in Australia. The Australian Draught Horse Stud Book Society was established in c.1979 to promote these horses and breeding programs. Today the Australian Draught Horse used in led, novelty, ridden and draught competitions and is still valued as a working horse on small farms throughout Australia.